The Monster Wash Press may be outfitted with a Muffin Monster® grinder to pre-condition the screenings before they enter the washer compactor. The grinder breaks open rags, plastics and trash to promote washing and removal of soft organics during the wash cycle. Additionally, preconditioned screenings result in superior compaction, reducing the volume of discharge that must be hauled away. Discharge from the pre-conditioning Muffin Monster or directly from the screen enters a Pre-Wash Zone where the debris is soaked to begin the process of separating organics from the solids. 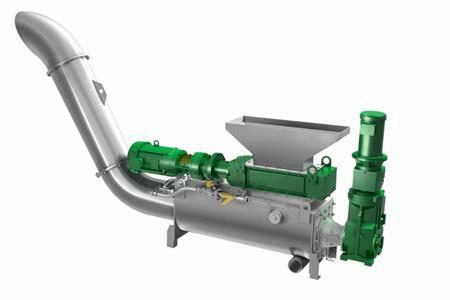 An auger rotor transports the soaked debris into the Active Wash Zone of the Monster Wash Press where a paddle spiral rotor* agitates the material, enhancing wash water penetration throughout the debris. The results is the effective washing of soft organics from the solids. The soft organics pass through a screen and are returned to the plant’s waste stream for treatment. The washed solids are moved to the Dewater and Compaction Zone where water is removed from the solids and the solids are compacted. The resultant discharge emerges from the Monster Wash Press as a dry, solid plug.